Employees of construction and renewable energy industries put in a hard day’s work. These rugged industries work year round, and across Canada, and put the equipment they use throughout the day through the ropes. These industries have long days in what can be extreme temperature ranges and weather conditions that make up Canadian seasons, and the two way radio is often just a small piece of your employee’s tool belt. This week, we will take a look at these two industries, as they are frequent users of two way radios not only for communication, but also for productivity and, above all else, safety in the workplace. Below, you will find three great options (in a good, better and best list) for team members working in these environments – which will work for both industries. We will also touch on accessory options for these industries, because these are workplaces that make use of accessories for more effective communication. Good: CP200d – This series of radios is one of Motorola’s top selling radios, and for good reasons. It has been tested in a number of rugged Canadian work environments, proving it’s a radio worth noticing. A few notes about this radio – while it has analog and digital capabilities, it’s important to know you have to choose one or the other, as they are not interoperable like other, more advanced two way radios. If you don’t want digital at the time of purchase, and want to upgrade later, it requires both a service and the purchase of upgraded firmware. The CP200d is rated as both splashproof and virtually dustproof and, when in digital mode, this two way radio will efficiently connect a workforce with strong levels of voice quality for its users and up to 18 hours of battery life with upgrade in digital mode. If, however, you think you might want to consider a digital two way radio down the road, consider one of the options below. Better: XPR3300e – This is a high value radio for its price point, and a great entry level option for a transition to digital, but is both digital and analog operable – so you can transition when your team is ready. Noisy workplaces are no issue with this radio, as its Intelligent Audio feature cancels noise and reduces background noise from vehicles, machines and equipment – allowing your message to come through in even the noisiest environments. And, with battery upgrade, you can rely on the XPR3300e for up to 28.5 hours before the need for a charge – now that’s reliable! Built with an IP67 rating, this option is both dust proof and can work in up to one metre of water for 30 minutes – perfect for your industry. Both compact and light, this is an all-around great product. Best: XPR7350e – This is the toughest commercial grade two way radio on the market – so you know it’s going to stand up to what you face on a daily basis. Stay better connected than ever before, while keeping your team productive and safe with this durable (both dustproof and waterproof), portable two way radio. 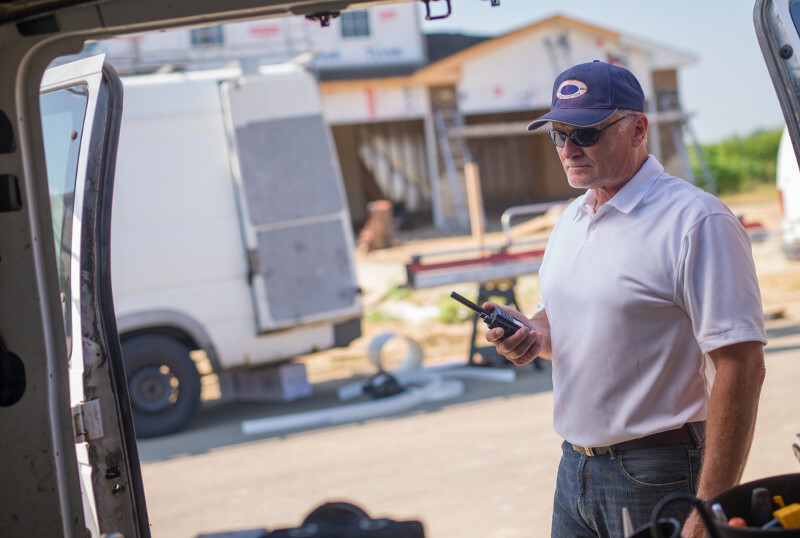 The XPR7350e also features Intelligent Audio – for those noisy days on the job when you need your message to come through, but don’t have the ability to walk away, along with 29 hours of battery life with upgrade. Digital two way radios are known for up to 40 per cent better range, and the XPR7350 is no different – which ensures that you can stay connected to your team when it matters most. Like we said above, these industries rely on accessories for complimenting their communications needs. Often times, utilities and construction workers depend on their accessories just as much as their radios. Popular items include speaker microphones, spare batteries and gang chargers for quick docking at the end of long work days. A number of workplaces require Intrinsically Safe (IS) accessories for an efficient workforce – ensuring employees and equipment stay safe in environments where potentially harzardous materials are present. A popular option for these heavier industries are headsets for hearing protection. It only takes one loud noise in these environments to impact an employee’s hearing long term, and we’ve seen great success in the use of Peltor headsets because of their high Noise Reduction Ratings (NRR). 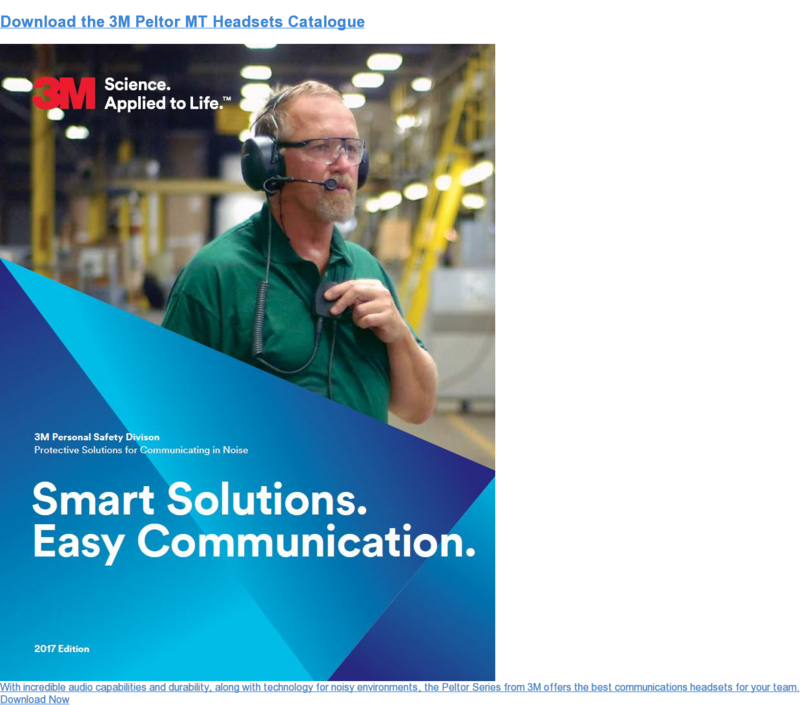 Noisy work environments benefit from the use of accessories with the best NRR – a number that helps you determine the overall sound reduction. Not only is there value in the protection provided by this accessory, but also the hands-free use of two way radio as a result. There are also Peltor accessories with the two way radio built right into the headset. The Peltor Litecom Plus is a two way radio and headset feature in one, for customers that require both. The radio is integrated into the ear cup, saving you from the need for wires or having to buy the headset and the two way radio separately. Options include over the head, behind the neck, or the most popular hard hat option that slides into the slots of your hard hat. Whatever your choice is, Nova Communications has the products you need to take your communications, and ultimately your safety and productivity, to a new level. With more than 30 years in the two way radio business, we have the knowledge and experience to satisfy your needs, and have worked with customers like you every day across Canada. Feel free to contact one of our two way radio experts who can aid you in figuring out the best radio and accessory options for your business. Click below to request a free consult with a Nova Communications team member!